Fun fact: when I was little I made a podcast (technically I called it a radio show but you get the idea) on Garage Band. With Garage Band, if you know you know. It was a pointless podcast, unless you cared about updates on my own soccer games or local weather, but I still enjoyed it. Call me ~progressive~, but I’m just going to draw a line between starting that podcast and having a really big love of podcasts now as a listener. What I appreciate about podcasts, besides the obvious entertainment or informational value, is that I can take them with me. Cooking dinner and trying to focus on the food I’m making? Perfect for a podcast. Long drive? I’m definitely playing a podcast so I don’t get bored. Out for a walk by myself? Listening to a podcast can be both relaxing and productive. 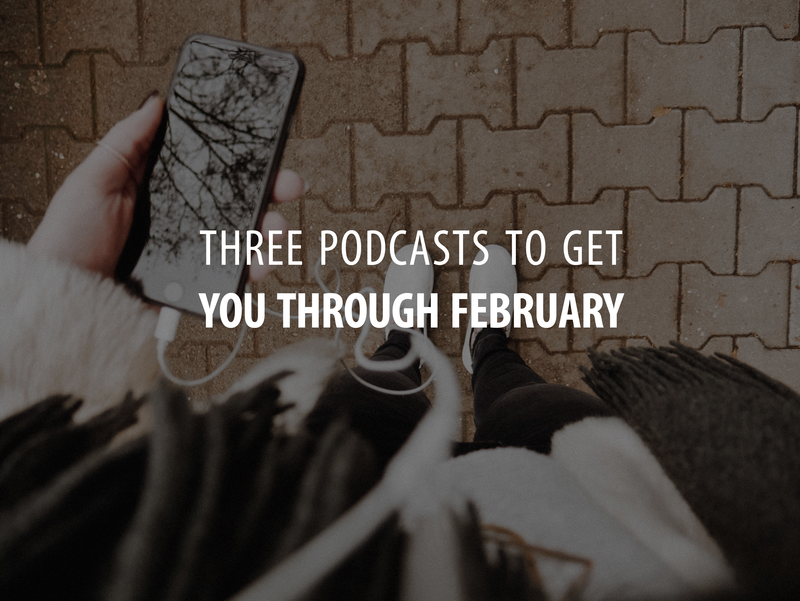 With January just about over, and what feels like 192 days of winter ahead, here are three podcasts to get you through February. BECAUSE with a tagline like “discover the hidden side of everything”, you are bound to find something that will interest you. Some titles to spark your interest include “Should America Be Run By…Trader Joe’s?”, “The Economics of Sleep”, and “Should Kids Pay Back Their Parents for Raising Them?” Each episodes is approached with both insight and knowledge, and a whole lot of humor. BECAUSE it’s a fascinating look into the Islamic State. Rukmini Callimachi, the New York Times’ foreign correspondent (she covers terrorism) who is the voice of this podcast, takes us through ten episodes that give an inside look at ISIS – both from those who were a part of it and those who felt its direct impact. Let me say it again: fascinating. I should note, though, that some episodes are pretty intense with the violence they describe. With a bajillion (official count) podcasts out there, it’s sort of hard to stop at just three. Here are a few more for you to try out – they’re ones I either want to check out myself, love but are already so talked about, or shows where I’ve only heard a few episodes. With that in mind, speed round ready GO. Serial An investigative series, with each season being a new topic. Not a new podcast, but season 3 is fairly recent. 100% recommend. 1,000%, even. The Minimalists Discusses minimalism as more than just getting rid of all possessions, and they cover a pretty wide range of topics (using social media intentionally, simple living, and yes, all of that clutter clearing). The Dirtbag Diaries What with this whole “hiking the PCT thing“, I just had to. I’ve listened to episodes here and there, and they always provide stories of adventure outdoors (both serious and hilarious). Oprah’s SuperSoul Conversations This one falls into the “heard so much about it but never listened” category. Probably won’t agree with every guest, but when do you ever? I’m intrigued by the wide variety of people she speaks to! Any podcasts that you absolutely recommend? Let me know your favorites!